One easy exercise tip is to go for a brisk walk every day, and you will lose fat. Everyone knows that. But why aren't you doing it? Maybe you think walking is boring. So here's a way to make it more interesting: get a canine walking companion. A study by the University of Missouri at Columbia showed that people who signed up to walk a "shelter dog" one hour a week lost a pound a month. That's 12 pounds a year. One short hour a week sure isn't much, either. You could do better than that and lose even more! I walk my 11-year-old Maltese almost every day. It's a lot more enjoyable than walking by myself. It's great exercise for me, and for her too. Don't have a dog? Do what the people in the U of M study did. Be a dog-walk volunteer for your local animal shelter. Not only will you get in shape, the dogs benefit a lot. Otherwise lonely and caged shelter dogs get some fresh air. They also get to practice companionship and walking with a leash. Shelter dogs walked regularly have a better chance of being adopted. Walking keeps them healthier and improves their people skills. If you have a dog, get outside and walk it! If you don't have a dog, volunteer as a dog walker at your local animal shelter. If you would like to own a dog, consider adopting a homeless one. Then walk him or her as often as you can! 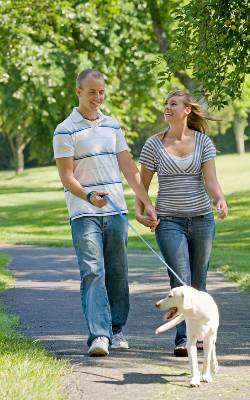 Walking your dog is a great way to meet your neighbors too. A dog is such an easy conversation starter. Just yesterday I met two new people while I was walking my dog. And she was the first topic of conversation both times.